Last week-end was a treat. On Friday I’ve decided to take the level 2/3 class that Tamal teaches before the teacher training, and it felt good! Like REALLY good! Since I’ve started the training I’ve taken many advanced classes, to improve my practice, challenge myself and mostly because back in my country i won’t have the oppotunity to follow this kind of classes. Tamal’s was one of my favourite, probably because of the handstand practice. You barely have a chance to practice handstands in regular classes, and I love that pose. It teaches me how to be more focus, and how to use my core. Speaking of core we had a great session about anatomy, watching videos. It is so important to understand how the body works, i finally know what’s the difference between tendons and ligaments lol. And now I have a better understanding of the poses. We also kept practicing teaching on each other and I really start to like it. Plus it makes me do some incredible improvements in my practice. For example knowing how to teach urdhva dhanurasana made me understand my own mistakes and now that i’ve corrected myself it looks and feels so much better! Sunday was the highlight of the week-end: as part of the training, we had to volunteer for 2 hours to clean the beach. I found the idea awesome. Most of the trainees were there and some other people. Someone found a bone, like a big white bone, we all speculated on what kind of bone it was (i guess we might need some more anatomy classes!!). The top 3 of the things i found were cigarette butts (smokers pollute our air AND our beach! Seriously? Quit! ), plastic bottles tops, and straws (the kind your kids use to drink juices in those little boxes…). Then we had this amazing philosophy talk about reincarnation and Karma. Yoga philosophy is so interesting and profund! I really enjoy it. It makes me see the world from a different angle. I can’t wait for this week-end talk: the need of stop eating meat for our sake and the sake of our planet. Week-end 3: It’s getting serious! On Friday we had a class of anatomy. 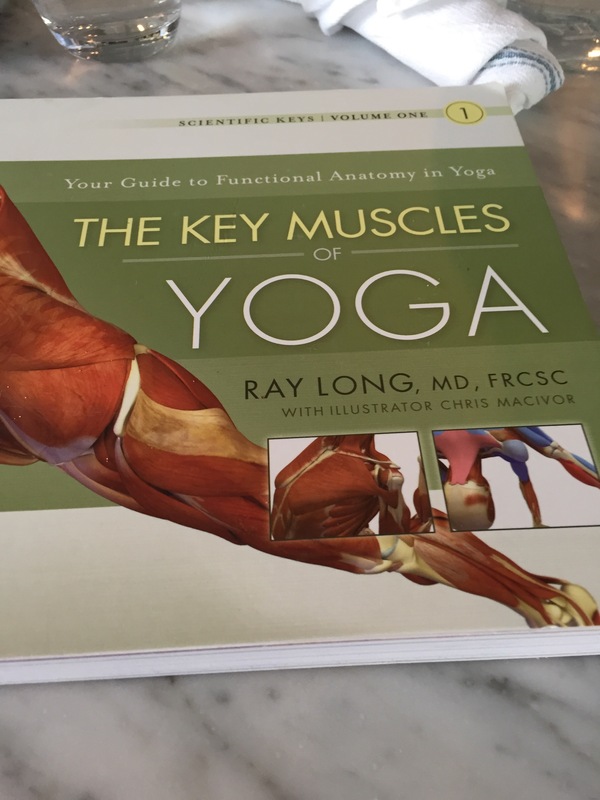 I thought it would be harder than that as english is not my first language, but it was ok.
Anatomy is so important for a yoga teacher. You need to understand the pose to get the most benefits of it. And of course you don’t want to injure your yoginis! Anatomy helps you to understand the best alignment, and again this is really important. You want to know why your back foot is open at 45 degres in warrior 1, and you want to be able to explain it if somebody ask. We practiced a lot too! We practice the postures and we practice how to teach the postures. This too will improve my yoga. Now when I go to a class I keep adjusting myself to be better in my posture, which can means to refrain to touch the ground with my hand in triangle pose for example, because by doing this I don’t open my chest that much. Learning how to teach is fascinating. You have a choice to make, are you going to say all the details of the pose or are you just going to ask your yoginis to do it, assuming they will know how to do it (bandas, alignment…). I personnaly give some details but not too much, because when I’m in a class and the teacher starts to give many info on the anatomy I space out, and she or he loses my interest. I guess it’s different whether you teach a class or a private . Sundays are made for philosophy. Because yoga is not only a work out, it’s so much deeper than that. We learned how to meditate, by chanting, or saying mantras, or using the malas. I personnaly meditate every morning since a few month and I feel great! Meditating with the beads is a little bit hard for me, but I do it every day now, so I’m surr it will come up. We also had a class about ayurveda. It was fun to find out about our dosha, (I am a Pitah) and what we can do to improve our health using ayurvedic medicine. My entire body is sore with all the classes I take my brain is full of new information but my heart is enlightened! I love my teacher training! This week-end we’ll help a non profit to clean the beach, it’s part of the training. I’m looking forward to it. Stay tuned!